Ice-bergers And Fries is a chocolaty brown cream. My unexpected favorite! I knew I'd like it, especially since it gives me another option for work manis, but I didn't think I'd love it as much as I do. I've worn it twice in just a few weeks. It's perfect for a SFW fall mani. 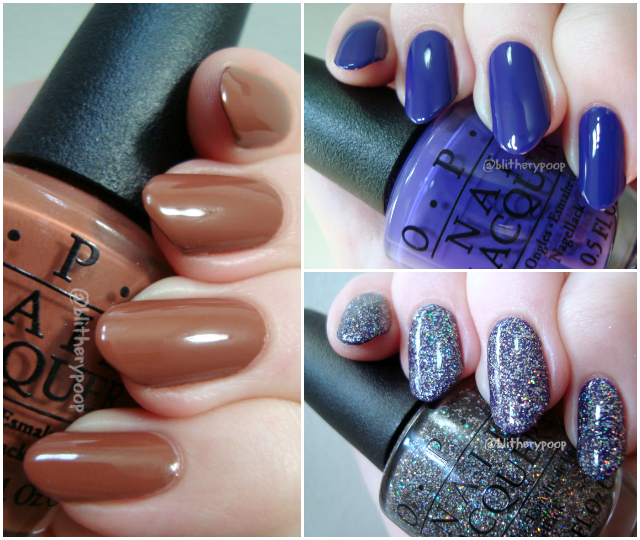 This is two coats and the formula is as perfect as most OPI creams. It's a touch darker on the nail than in the bottle. Do You Have This Color In Stock-holm? is a bold blue-toned purple. My Voice Is A Little Norse has tiny silver and silver holo glitter in a gray tinted base. Like In True Stefani Fashion, I'm not really sure if I should be wearing this one over another polish or on its own. This is two coats over Stock-holm, so I'm thinking 4-ish on its own. I've looked at other people's photos and the swatch cards in stores and I just can't see myself wearing it like that. The base is too sheer. I might try it over a gray cream or jelly though. As you might guess, it takes a lot of topcoat to smooth it out. I used 4-ish coats of topcoat here and I'm still not confident that it wouldn't get bumpy again as it dries. Bottom line: I lovelovelove Ice-Bergers And Fries! 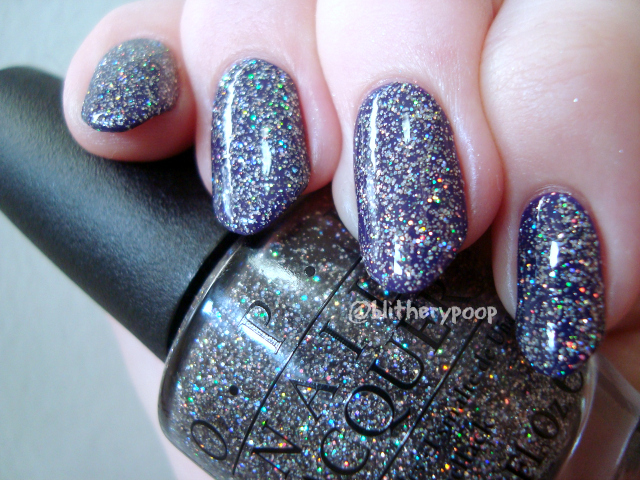 Do You Have This Color In Stock-holm is pretty, but the formula isn't up to the usual OPI standards. My Voice Is A Little Norse is gritty, but the sparkle payoff is good. Did you get anything from this collection? I feel like I'm the last blogger to post about it.